In this video we will discuss table valued parameters in SQL Server. Table Valued Parameter is a new feature introduced in SQL SERVER 2008. Table Valued Parameter allows a table (i.e multiple rows of data) to be passed as a parameter to a stored procedure from T-SQL code or from an application. Prior to SQL SERVER 2008, it is not possible to pass a table variable as a parameter to a stored procedure. Let us understand how to pass multiple rows to a stored procedure using Table Valued Parameter with an example. We want to insert multiple rows into the following Employees table. At the moment this table does not have any rows. Step 2 : Use the User-defined Table Type as a parameter in the stored procedure. Table valued parameters must be passed as read-only to stored procedures, functions etc. This means you cannot perform DML operations like INSERT, UPDATE or DELETE on a table-valued parameter in the body of a function, stored procedure etc. Step 3 : Declare a table variable, insert the data and then pass the table variable as a parameter to the stored procedure. That's it. 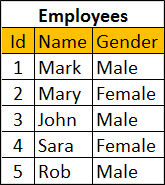 Now select the data from Employees table and notice that all the rows of the table variable are inserted into the Employees table. Thanks Venkat Please could you Upload a video on Paging in SQl Server with implementation in asp.net. Paging is explained in gridview section part 55.